Product code: ES6459 Categories: Sold Items, Sold Rings. Perfect in all respects, this antique sapphire and diamond ring dates from the early part of the 1900’s and would suit any finger including making a wonderful example of an antique engagement ring. 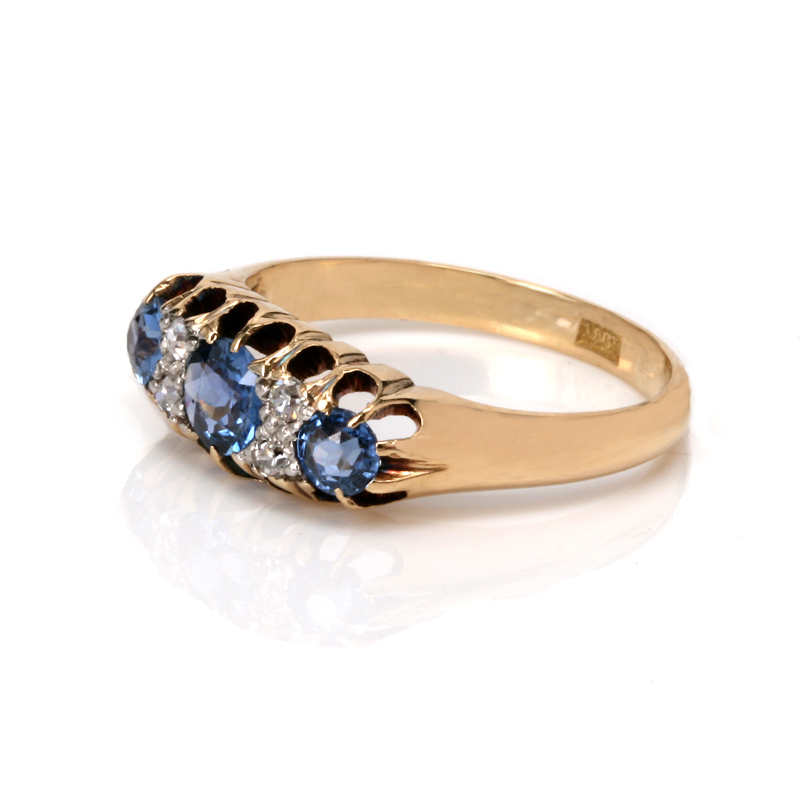 Hand made in 18ct yellow gold, this sapphire and diamond ring is set with three round facetted Ceylonese sapphires that all match perfectly and have a wonderful cornflower blue colour to them and a great transparency to match. On each side of the centre sapphire is not one but two diamonds that not only add the right amount of sparkle but that extra charm gained from a hand made ring and having two diamonds. These diamonds total 0.04 carats and the sapphires total 0.82 carats and together set into the 18ct yellow gold, all come together perfectly. From one side across to the other this distance measures 14mm by 6mm wide at the centre and sits perfectly on the finger without sitting up high making it a very comfortable and practical ring to wear all the time. There is nothing quite like a genuine antique ring to adorn your finger, and no matter what the occasion, this antique sapphire and diamond ring is just gorgeous.